Julie d’Aubigny (aka Mademoiselle or La Maupin) was a 17th-century bisexual French opera singer and fencing master who killed or wounded at least ten men in life-or-death duels, performed nightly shows on the biggest and most highly-respected opera stage in the world, and once became an initiate at a convent just so that she could rescue her lover. Hopefully, something in that paragraph has captured your attention. D’Aubigny was born in 1670 into a life of wealth and privilege. Her father, Gaston d’Aubigny was a secretary to Louis de Lorraine-Guise, Comte d’Armagnac (the Master of the Horse for the king, Louis XIV). Her father had her trained in horseback riding, dancing, literacy, drawing, and fencing. During her training she also picked up drinking excessively, gambling, and fist fighting. Julie d’Aubigny is rumored to have started an affair with her father’s boss, and soon became his mistress. When she proved too much to handle, the Comte d’Armagnac had her married off to Monsieur de Maupin of Saint-Germaine-en-Laye. He received an administrative position in the south of France, and eventually in one of the colonies overseas, while Julie decided to stay in Paris. Although her married life was short-lived, it did provide her with a title, some money, and a wedding ring, all of which allowed Julie to use her marital status to get away with her scandalous behavior. In the following years, d’Aubigny gathered a reputation as a wild woman who scrapped and fought with young aristocrats and commoners alike. She became involved with an assistant fencing master named Serannes. In about 1688, when the police tried to apprehend Serannes for killing a man in an illegal duel, the pair fled the city to Marseille. In Marseille, d’Aubigny and Serannes gave dueling exhibitions and sang and told stories in inns. When dueling, d’Aubigny dressed in male clothing but did not conceal her gender, which served to increase interest in her. In fact, once while performing on the street when a spectator would not quit bothering her about whether or not she was truly a woman, she ripped open her shirt and asked him to judge for himself. When she grew bored of Serannes, she hooked up with a young lady. When the girl’s parents put her away in a convent in Avignon, d’Aubigny followed, took Holy Orders, entered the convent as an initiate, stole a body of a dead nun, placed it in the bed of her lover and set the room (and subsequently the convent) on fire to cover their escape. She then continued the affair with the young lady for three months before returning her to her family. As a result d’Aubigny was charged—as a male—with kidnapping, body snatching, arson, and failing to appear before the court. The sentence was death by fire. (She eventually pleaded with the Comte d’Armagnac to help her out and he in turn convinced the king to nullify her sentence). D’Aubigny decided it might be in her best interest to head back to Paris, and it was at this time she began working at the Paris Opera, a huge step up from her street preforming gigs. As the lead actress in the world’s most respected Opera, d’Aubigny performed the roles of Pallas Athena, Medea, and Dido. In addition to her flair for the dramatic and innate musical talent, it also helped that d’Aubigny had a near-photographic memory and rarely needed to read her lines more than once before committing them to memory. Of course, given her nature she also ended up sleeping or dueling with most of the members of the Opera. One story states that an actor was being overly-aggressive while talking to one of Julie’s friends, and when she intervened he wasn’t happy about it. Later that night, as he was walking home, he found Julie standing in the street, weapon drawn, challenging him to a duel for honor. When the guy refused to duel her she beat him with a wooden cane, stole his pocket watch, and left him in an alley. The next day, when he came to work with visible wounds and people inquired about his injuries, he claimed to have been assaulted by multiple men. D’Aubigny (also known for humiliating men as a street performer) pulled out the pocket watch and called him out. Then, to make matters worse, she then forced the dude to kneel and beg forgiveness in front of all his co-workers before he could get his stuff back. During her travels she continued her tradition of loving and fighting, and sometimes both at the same time. For instance, in Villeperdue she fought a victorious duel against three squires and drove her blade through the shoulder of one of them. The next day she asked about his health and found out he was Louis-Joseph d’Albert Luynes, son of the Duke of Luynes. The next evening one of his companions came to offer his apologies and she appeared in his room in female clothing. They became lovers. Eventually after dueling, singing, and making out with as many men and women as she could, Julie eventually reconciled with her husband and lived with him until his death in 1701 (possibly 1705). 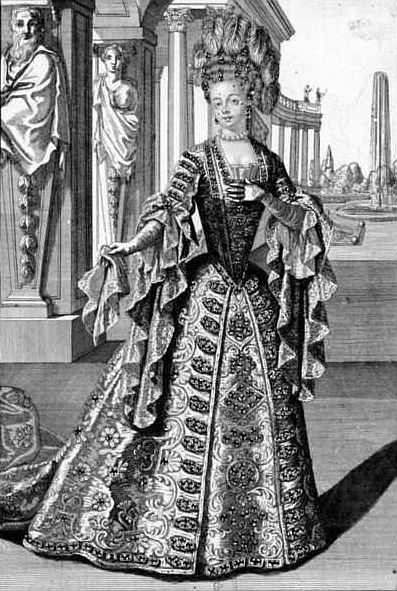 After she retired from the opera in 1705, she entered a convent in Provence, where she died in 1707. D’Aubigny is also the primary influence on Theophile Gautier’s work. He was asked to write a story about d’Aubigny, but instead produced the novel Mademoiselle de Maupin, published in 1835, taking aspects of the real La Maupin as a starting point, and naming some of the characters after her and her acquaintances. The celebration of a purely sensual, yet unconsummated love was found deeply troubling to the 19th-century critics and press.